If you owe so much money to others that you can’t even afford to pay the interest accrued on the loan, and there are no promises of large cash influxes in the near future, no one will loan you the money to pay your monthly interest expense, let alone pay down the principal you owe. Assume you have a $30,000 credit card debt. The interest rate is 17%, so you are required to pay $418.89 a month – just in interest. In this example, using the numbers/income that apply to Getty’s situation, you would only have $52.36 of your income you can use to pay down your debt, thus you have NO WAY of paying off a mounting debt when your monthly increase in debt is 8 times what you have to pay down the debt. I can’t make it more simple than that. If any banker looked at your situation above, there is no way they would loan you more money, it would be highly irresponsible – even predatory lenders wouldn’t touch the above situation. As such, Getty is doomed. Sources with knowledge of the situation revealed that mid-level financers were recently asked to come to New York City by Getty to discuss additional funding. Their take-away was that they were unimpressed. Getty, no doubt at the behest of their parent company, the Carlysle Group, is trying to stem the blood-letting. There will be no silk purses from this sow's ear. More and more, Getty is not producing the content they once were, and they are relying on their platform as a distribution of other third-party content producers, such as Getty licensing the content from The Washington Post, The New York Times, or Sports Illustrated. Getty does have a few pockets of staff photographers in some areas, and those photographers are constantly producing, and in the short term, will continue to do so. 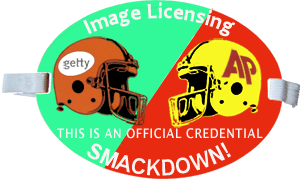 And yes, Getty is very publically present at major sporting and entertainment events (largely because they are contracted to do so by those organizations), but beyond that, their content production has significantly diminished – they are much more curatorial than being an original content-producer. Stories from inside Getty reveal that cost-cutting and restrictions on spending have never been tighter. Case in point – Getty staff photographers used to find themselves in various “tiers” that categorized their tenure and caliber, and as such, their salary. These tiers have effectively been done away with for cost-saving purposes. Another example centers around Getty staff photographers, who were able to generate additional revenue from the content they produced by earning a percentage of the licensing of those images. That has been reduced to a 12-month rolling window only. The next step will be to do away with it completely. It has been suggested that the impending demise of Getty Images may be bad for news photographers, and I’m not sure that that bears out in the light of day. The news isn’t going away. News photographers should tell their stories and they can use a platform like Newscom or Getty. One solution would be for Getty to open their platform beyond the big players – NYT/SI – and take a nominal percentage. It seems that if a photographer with content on their own Photoshelter archives could feed their images through Getty and convey to Getty a 10% royalty on those individual licensing fees, Getty could generate revenue, however these photographers would have to opt-out of the all-you-can-use subscription models, because the sad joke amongst all photographers who license their work within these models is where the sales reports show the $1.51 and $0.49 licensing fees. Frankly, Getty has been a massively negative contributory influence on news photographers and their ability to survive and thrive, and Getty has in turn licensed that content for less than it costs to produce to news outlets. One need only look at the demise of Sports Illustrated's team of photographers - Getty photographers are, more and more, filling those pages, and the magazine decided they could dump their staffers. I wouldn't say that Getty is the only reason SI made this move, but it certainly was contributory. Frankly, a reduction in news coverage by Getty either because of belt-tightening and fewer assignments, or their demise will force a re-set by those who have come to rely on Getty for images. In fact, it not only may mean a few more staff photography positions, it also certainly will mean more freelance work for individual papers, and, perhaps, even another editor or two hired to assign and manage those incoming images. What is bad for news photographers has been a situation where Getty has been able to convince someone to shoot an assignment for less than it would cost to rent the equipment and hand the equipment to a monkey. Zero value has been placed on the valuable contributions of the actual photographer. That will change once Getty is gone. How did Getty arrive at this spot? Getty Images first hit the stock market during an IPO on July 2, 1996 on the NASDAQ before moving to the NYSE on November 5, 2002. Much of the public scrutiny on Getty diminished when, after a disasterous turn in the stock market under what was then the ticker GYI, and it seemed, for the Getty family to help defend the impending failure of a scion of the famed Getty family, Mark Getty, one of the many private equity funds they have a relationship with, Hellman & Friedman, in 2008 took the company off the stock market and private, where no one had to see the further decline, and where, according to a March 2012 article on private equity citing Moody’s (here) notes that “certain Getty family members” were also shareholders. While the taking private of Getty was reported as a a 2.4B transaction, H&F only “invested up to $941.3 million equity in Getty as part of the buyout, according toSEC filings.” a pair of dividends in 2010 and 2012 effectively allowed H&F to make back most of their investment. Enter the Carlysle Group. In September of 2012, Moody’s reports on their review of $2.6B in debt that, according to the Moody’s report here “The new debt instruments are being issued to fund the acquisition of the parent of Getty Images by an affiliate of The Carlyle Group.” Moody’s goes further, “The downgrades reflect the increased amount of funded debt and related interest expense resulting in higher debt-to-EBITDA leverage and weaker coverage ratios.” Carlyle bought Getty for $3.3B in 2012. "EBITDA is essentially net income with interest, taxes, depreciation, and amortization added back to it, and can be used to analyze and compare profitability between companies and industries because it eliminates the effects of financing and accounting decisions." Now, let’s take a look at an article by Forbes (here) where they note, “In reality, EBITDA is akin to a blender, into which go normal financial statements and out of which comes a number that always seems to make the subject company look better than it did when the numbers went into said blender.” That said, if everyone is using the same “lie” then even though it’s an erroneous yardstick, it’s the same erroneous yardstick for everyone. Now, coming back to the September 2012 report, one of the really interesting things (if you like to read the fine print, that is) is that they provide the rationale behind their actions, and in this case, they are explaining why they downgraded the Getty debt. 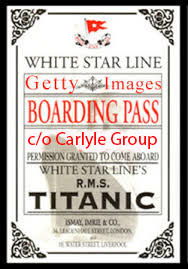 But let me reiterate one point from above – about GETTY debt - “The new debt instruments are being issued to fund the acquisition of the parent of Getty Images by an affiliate of The Carlyle Group.” Does that make sense? Carlyle is using loans they are getting to buy Getty, and then making Getty responsible for paying the loan back. It’s perfectly normal to loan someone more money than they earn in a year. A person who earns $40,000 a year can have no more than 28% of their gross income each month usable for their mortgage. That means a house payment of no more than $933 on a maximum home price of $184,204. 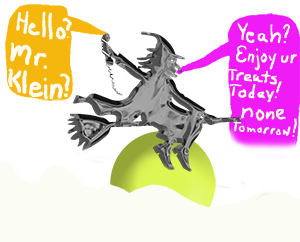 (more here ) and (here). The assumption is that that person will continue to earn that much, if not more, and remain employed. When a company is in an environment when their product sales figures are on the decline, that becomes a problem. In December 2014, Three months ago, 15 months after the last report, Getty in fact, gets downgraded from stable to negative (see here) where they become what’s called “B3” on $2.5B of debt. What does that mean? “B” is defined as “Obligations rated B are considered speculative and are subject to high credit risk” but it gets worse. Moody’s notes “Moody’s appends numerical modifiers 1, 2, and 3 to each generic rating classification from Aa through Caa. 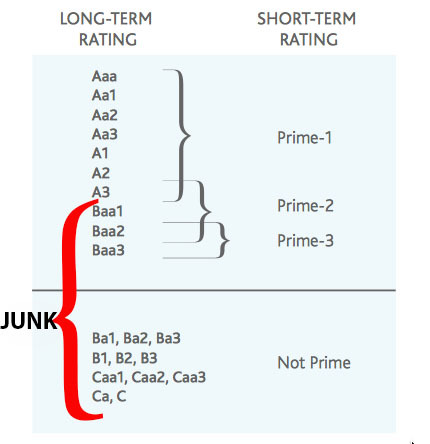 The modifier 1 indicates that the obligation ranks in the higher end of its generic rating category; the modifier 2 indicates a mid-range ranking; and the modifier 3 indicates a ranking in the lower end of that generic rating category.” So, they are already in the “junk” category. Their rationale refers to “reduced free cash flow-to-debt” into about 2017. They again refer to “persistent revenue declines in the Midstock segment since the second half of 2012 compounded by increased operating expenses from stepped up investments in personnel, marketing, and technology largely aimed at positioning the Midstock segment to be more competitive. The operating performance of Getty Images is well below its plan presented in the October 2012 buyout which underestimated the impact of aggressive competition in Midstock.” Yet, the market doesn’t seem to be the problem, it seems to be Getty that is the problem, when they note “to the track record of competitors, including Shutterstock (publicly traded) and Fotolia, to grow their stock photo revenue by high double digit percentages.” They report that “Management confirms that excess cash will be used primarily to reduce debt balances with acquisitions being put on hold.” (Below is a breakdown of the various ratings nomenclatures from Moody's. More on Moody’s “ratings” system here ). The above explains why the mid-level financiers who recently paid Getty a visit were unimpressed. They saw the writing on the wall. 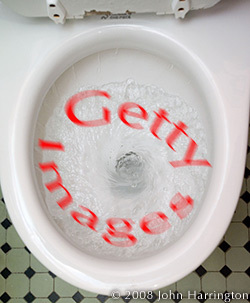 In the last few days, a flurry of discussion has centered around A Bloomberg News report, Getty Images Is Running Tight on Cash (here) and a follow up, Getty Images’ Outlook Blurs as Photo Rivalry Triggers Price War ( here ) which lead to revelations about the dire circumstances at Getty. Let’s take a closer look at what was reported. While Moody’s dire reporting was coming out, Getty was finishing 2014 “burned through a third of its cash in the last three months of 2014 as declining earnings limit the Carlyle Group LP-controlled photo archiver’s ability to invest and curb its access to credit…” and as a result, they only have $27 million left. Their February 23rd disclosure, according to Bloomberg shows a further decline of 7% for EBITDA, making things even worse. Under the terms of their previous loans, because their EBITDA is greater than 6 (remember, it’s 8, and normal companies are around a 3) they can’t even get a loan. Further, as Bloomberg reports, they do have a $150 million credit line, but can only take $30 million of it because they are already over-extended. If they accessed more, they would be in violation of their other loan contracts. Getty now either has wholey-owned content of images they represent of approximately 170,000,000 images. Sources with knowledge of how valuators determined the value of that library-as-an-asset, each image is valued at $0.15 per image. That means the total valuation of their image library, were it to be sold off now, is $25,500,000 (that’s 25.5 million). How many of those are they relying on in the mid-stock segment? According to Getty, they have just 8 million images that are unique. That means the unique value of their mid-stock image library is just $1.2 million. Even if the figures are much higher, the reality is that blood is in the water as Getty competitors, with no debt seek to topple Getty that is bleeding out. Both Shutterstock and Fotolia are leading competitors in that arena, and a price war, according to Bloomberg, is now underway. In an era where Getty must increase revenue, the concept of “selling for less and making it up on volume…” is just not going to work. It did not help that last year Getty made tens of millions of their images available for free online (reported here - Monetizing Getty's 35M Image Archive via FREE Editorial Uses, (here) but the idea was to forgo what was just a few cents to a dollar in exchange for what was to be a critical mass of images providing viewer tracking data that Getty could then leverage to marketers and advertisers and be able to project revenues into the future. That didn’t work out so well. Here’s a hint – they won’t improve. Getty has made it clear in disclosures to Moody’s that they are not going to be acquiring other companies. Even if they wanted to, they don’t have any assets to do so. There is a strong distaste amongst contributors about the constant decline in the contributors’ share of licensing revenues, so a short-term shift further of even worse percentages would create a long term problem from which Getty would never recover. Getty could utilize their platform that is already ingrained into the desktops and web-browser bookmarks of publishing entities around the world, and serve as a content platform only. Yet, companies like HBO, which started as a re-seller of movies moved successfully into producing content, and more recently, Netflix did the same thing, again, producing content. Getty is clearly moving away from that model. Getty has a number of properties within the corporate umbrella that could be salable assets. They license video, audio/music, and microstock sites iStockphoto and Thinkstock. They also have valuable contracts with a number of sports leagues that could be sold to competitors. One contract that first started with WireImage was the NFL contract, which was largely the reason that Getty acquired WireImage) which now is in the hands of the Associated Press after a 2009 vap-getty-cred-300x179.pngendor change. Contracts with the NBA, NHL, and MLB all could be picked up by AP, Reuters, Corbis, or another provider. MLB extended their contract with Getty in September of 2013. 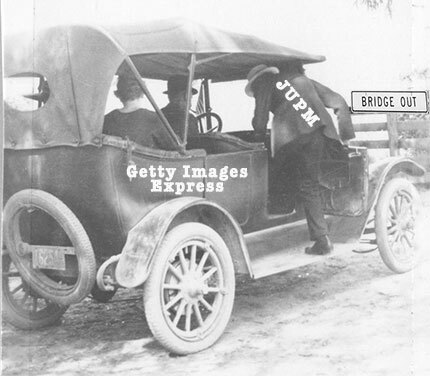 Getty also has intellectual property of PicScout – the largest commercial image-recognition platform for locating and identifying unauthorized uses of photographs. It was acquired in 2011 by Getty and remains operational as a separate entity under the Getty umbrella. Each of these sub-entities could be spun-off or sold-off in a breakup of Getty. Under a bankruptcy scenario, these assets would all be sold off, but with no clear entities strongly interested in the assets, they would be for pennies on the dollar. The limited Getty staff photographers would be looking at the other wire-services for employment, because most if not all of them are highly talented. As for images, at 15-cents an image, those 8 million unique images would, as noted before, be valued at just a $1M or so. Where they will get anywhere close to the $2B+ they owe will be an exercise that involves a lot of smoke, mirrors, and a dance I’ve never seen before. Say what you will about photographer Peter Lik, but you don't have 15 art galleries and a Chief Financial Officer and then belong anywhere but in the category of "successful businessman." 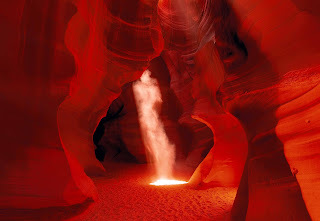 An interesting article in the New York Times about Lik - Peter Lik’s Recipe for Success: Sell Prints. Print Money. somehow gave fodder for Artnet News to opine "New York Times Exposes Peter Lik Photography Fraud". Now, where do they get "fraud" in the NYT article? Questions? Sure. Fraud? That remains to be seen. "When 95 percent of an image has sold it becomes “Premium Peter Lik” and the price jumps to $17,500. At 98 percent, it’s “Second Level Premium Peter Lik” and leaps to $35,000. And when the image gets down to its last handful, the prices can go as high as $200,000 or more. When all copies of a photograph are sold, it can gross the company more than $7 million. So, if someone wanted to by an entire edition of one of Lik's photographs, it would cost them "more than $7 million" and they'd have 995 prints in a stack. So, when someone pays "only" $6.5 million, they have one print and don't have to deal with 994 other prints, and they are saving at least $500,000. AND, they then have a one-of-a-kind piece to boot." There are all sorts of quotes and colloquialisms "art is what you make of it", and "one person's junk is another person's treasure", and as Andy Warhol once said "Making money is art and working is art and good business is the best art." Oh, and you could quote P.T. Barnum's circus competitor, who, in cricism of Barnum, said, "there's a sucker born every minute." "It’s a truism that the price of a commodity doesn’t always correlate to its value. This is especially so in the art market, where experts say a stunningly small percent of what is sold will ever be worth more than it was on the day it was acquired." "With photos sold in limited editions of 995, Lik is able to create artificial demand by driving up the prices as he sells more copies." How, exactly, is that any different than any other artist with editions? Ansel Adams? Picasso? Norman Rockwell? Thomas Kinkade? Every artist sets their edition sizes, creating an artificially limited supply. This is standard in the art world, yet they roll it out a criticism of Lik? Don't get me wrong - when Lik is quoted by the NYT as saying “I’m the world’s most famous photographer, most sought-after photographer, most awarded photographer,”, or “If you’re in Caesars Palace, you’re no joke,...That was a huge turning point. I’m in Caesars. I’m God. Nailed it.”, I think he's gone too far. "Most famous?" Well, depends on how you define "famous" - he's sold more signed prints than anyone else it seems. This argument also works for "most sought-after" too. Yet, he's using over-the-top marketing speak. When someone writes about Diamonds "She already knows you love her, now everyone else will too", or BMW's "The Ultimate Driving Machine" or Mercedes' "you deserve the very best" slogans - no one faults them. Lik is making money, and lots of money at that. He's creating a demand for prints with an escalation of print prices as the edition sells out. He's no different than another self-taught photographer Rodney Lough Jr, who's creating an escalation of pricing with increased "appreciation levels" as editions sell out. In 1996 While Lik was selling postcards in Australia, Lough started his company in Oregon also selling landscape photography in limited editions as art, leaving his corporate life behind - both Lik and Lough are currently 55 years old. I suspect it's possible that Lik learned about these escalating prices and editions and scarcity from Lough. Lough will also "pre-sell" an edition, even before it's shot - sight unseen. So, you're buying a piece of Lough's future "vision", not even knowing what it looks like. The photographic world of "art" is evolving rapidly, and also trying to evolve into an existing "art world" with trend-setters and taste-makers somehow telling people what's "in" and what's "out." Lik rejects that. How many "it" artists find themselves broke and penniless after the art world turns on them or they suddenly are no longer the "it" sensation? In the NYT article, they note "The message is that the sooner you buy, the less you will pay. So buy now. 'If we had them at $3,950 the whole time, where is the sense of urgency?'" Indeed. Is it factually inaccurate to say "“This photograph started at $4,000 and it sold out at $200,000"? No, it's not. Someone bought an early edition of a print at $4k, and others later paid $17,500, and $35,000, and yes, eventually, it sold for $200k before no longer being sold. Fraud would exist if Lik later re-printed the image and started anew. Is art a good investment, photographically or otherwise? Generally speaking, no, it's not. People say, of art, "if you like the art, if it speaks to you, buy it because you like it." I agree. It is smart business to be very up front and say "it's $4k now, and in 8 months, it'll be $20k - the price goes up the scarcer it gets." Sure, people may be trying to re-sell a print and be having a hard time - right now. Others, like the Chicago real estate developer has 50 or so Peter Lik prints, and he's happy. The people he shows the photos to are "delighted." The article notes "that the vast majority of Mr. Lik’s buyers are not well versed in the secondary art market" and it may be that conveniently located galleries in tourist destinations where there is high traffic and disposable income means that higher-net-worth people have $4k to drop on a photo, but when people are spending $35k and $200k in a photograph, these people are not idiots - they have huge piles of disposable income and want what they want and can afford to choose to buy these things. Who are we to say they shouldn't, any more than we should tell everyone to buy a Toyota or a Chevy as transportation because a Bentley or a Maclaren is just wasting your money? His galleries are smartly located and his sales teams well trained, and the NYT article notes that they risk their jobs if they start talking about Lik's works as an "investment." The Wall Street Journal in an article here notes that the art-as-investment industry is nascent at best, with little evidence a mid-teens return can be even be achieved yet. So why are people so focused on a "secondary art market"? "Mr. Adams had printed his work in open editions up until then and sold the work for very little money. With the landmark decision to cease printing, they created a limited supply...Adams was by then in his 70s and had grown weary of the difficult darkroom toil." I'm not suggesting here that Lik is Adams, and Lik certainly is quoted as having taken a swipe at Adams in the NYT article, but the concept remains - scarcity is the key to an increased valuation. With Adams gone, his print prices have increased. I'm guessing that will be the case once Lik is gone, but that seems like it'll be many decades from now. In the meantime, those who have Lik pieces will enjoy their beauty, and no one has criticized Lik as having less than beautiful work, they've just criticized his marketing speak, success and business acumen. ---------------- UPDATE: For a reason which Artnet News has not explained, following (but, one can not say definitively, as a result of) this blog post they changed the title of their original blog post from "New York Times Exposes Peter Lik Photography Fraud" to "New York Times Exposes Peter Lik Photography Scheme", yet the original post URL with the word "fraud" in the URL points to the same article, yet the resulting URL displayed text now has "scheme" in it. Googles' dictionary here lists a few definitions - among them, as a noun, 1) a large-scale systematic plan or arrangement for attaining some particular object or putting a particular idea into effect; and as a verb 2) "make plans, especially in a devious way or with intent to do something illegal or wrong." Yet, they still characterize what he's doing as "fraud" when they write, in the (new?) last paragraph of the post "Perhaps the biggest believer in the Peter Lik fraud is the photographer himself."